An app that shows how long TSA lines are at an airport. We were inspired to create the app based on long security lines at the airport. At Midway International Airport in Chicago, security line wait time reached over two hours multiple times during the summer. As a result, we decided to create a web app using Delta's API that would estimate TSA wait times based on waits at similar times on previous days. The app uses the Delta API to parse the available wait times at security checkpoints. It then calculates an estimated time that the user of Fly On Time would wait in the security line based on previous wait times for when the person is planning on arriving at the airport. For example, if a user of the app wants to estimate their wait in security at 8 AM in Atlanta, Fly On Time extrapolates data from the API for previous wait times at 8 AM in Atlanta. The app runs on Python. We used requests to obtain the necessary JSON files from the Delta API and numpy to obtain statistical data about wait times. Flask was used to for backend operations and we used Heroku to host the app online. We wrote the front end of the website with HTML and CSS, and our domain name is provided by Namecheap. Getting the domain name to work and linking Heroku to our Flask project were our biggest challenges. Because we had little experience with Heroku, we spent several hours not only writing the front end, but also determining how to connect the Flash project with Heroku. We also spent a decent portion of our time experimenting with Django before concluding that Flash was more friendly towards the project. We are proud of being able to implement APIs, read and extrapolate data, and determine how the data can be applied to improve the traveling experience for Delta Airlines passengers. In addition, we are glad that the app can have long lasting and positive impacts on airplane travel within one of the largest airlines in the world. We learned how to use and access APIs in Python, extrapolate data with numpy, connect a Flask backend to an HTML frontend, customize our own domain name, and deploy a Python app through Heroku. Fly On Time could be used to suggest an arrival time at the airport, based on whether the flight is domestic or international, if bags are being checked, and if travel is occurring during a holiday or holiday season. 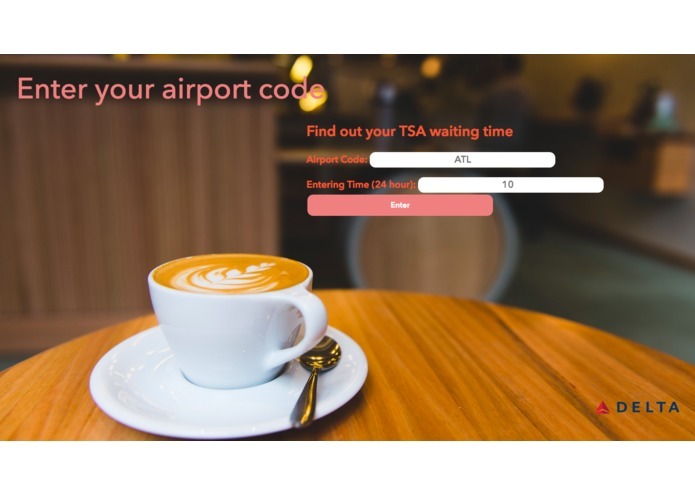 As Fly On Time has more access to Delta's API and obtains more data, it will be able to make more precise predictions about TSA wait times and the pre-boarding process. I worked on the backend, HTML and CSS. In addition, I worked on layout, functionality, and flow of the app. I worked on the data science of collecting the relevant information for the app. I then worked on the HTML and CSS of the website. My python data science file was the basis for the back end.